The first cries from your baby is a wonderful sound. If after six weeks however your baby is still crying it can cause stress and anxiety. Worries about your baby's health and whether you are a good mother and doing all the right things can appear. It is tiring and frustrating but there is usually a good reason which has nothing to do with your parenting skills. Colic is a big cause of baby's unhappiness and restlesness. When is it classed as colic? When a baby cries for at least three hours a day, three days a week, for three weeks. Other crying behavior that does not quite meet this can also be very difficult for parents. All babies cry. The crying usually increases after birth and at 3 weeks it reaches its peak (1.5 to 2 hours per day) and then it decreases again. 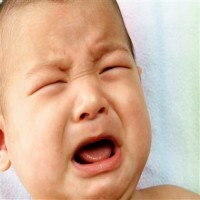 No cause has been found why some babies cry more than others. Many people blame it on intestinal cramps. The crying behavior, which can drive parents to despair, generally disappeares in the fourth month spontaneously but it sometimes lasts longer and no physical cause has yet been found. Crying caused by intestinal cramps can be recognized by a reddening of the face, a deep frown, and red legs. The baby then starts to scream. Such an attack lasts for a few minutes and often repeats itself. During such an attack the baby is inconsolable. You also hear loud bowel sounds and then you know that they are cramps. Passing stool and / or wind usually helps; the complaints are then often temporarily reduced. The baby is already a little person with his own temperament, character and the ability to process information or not. Stimuli such as sound, light, bright colors, complex-visual patterns, touching or moving the baby or eye contact alone can be too much. If you recognize this, possibly prior to a crying fit, it may be that the baby is over stimulated and it is important to reduce this by, for example, not having the TV / radio on continuously. Also ensure that all physical causes (food allergy, hunger, ear infection, gastro-oesophageal reflux, neurological problems, drug use of the mother during pregnancy, etc.) are excluded. You've probably tried everything: rocking, appeasing, hopping, singing, crying, running away ... nothing helps. The desperation strikes and before you know it you're in a vicious circle: your child cries incessantly, you get stressed, your child cries even more ... Often, then, the old principle of 'rest, regularity and cleanliness' is advised when it comes to feeding. If this does not work or has no effect, seek help. Go talk to your doctor or to the consultation office. Try to keep courage and remember that your baby can not do anything about it either.